Another entertaining Mac McKenzie novel from David Housewright. 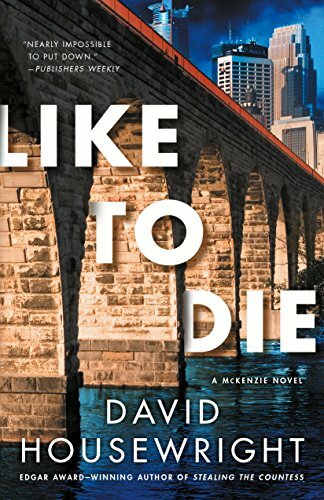 Like to Die is the last book published to date in the series, and as it happens it’s the last I plan to read. The author tipped his hand at last. More on that further down. Mac McKenzie, millionaire former St. Paul police detective, does investigative favors for friends from time to time. One of those friends is dating Erin Peterson, better known as “Salsa Girl” in spite of her blonde hair and blue eyes. Erin manufactures six highly regarded flavors of salsa in a factory in St. Paul, and business is great. But somebody super-glued her factory locks shut one night. Erin doesn’t think that’s worth calling Mac in for, but then someone does the same to the locks on her company trucks. So she agrees to let Mac look into things. But she’s strangely reluctant, and Mac realizes he doesn’t really know much about Erin at all. Turns out Erin and her business have problems with a big distributor. Not to mention with a flaky partner, a Mexican drug cartel, and organized crime. Erin has deep, deep secrets. I enjoyed Like to Die very much, for the most part. Mac is a splendid main character, and the cast of supporting players is vivid and fun – especially the enigmatic Erin. But this time author Housewright reveals his politics, a topic on which he’s been pretty evenhanded in the past. A conservative Christian is portrayed in such a stereotypical manner that I wondered if I’d stumbled into a Saturday Night Live sketch, or a Lee Child novel. Also, the charge of racism, which Householder has aimed at Norwegians in the past, is now extended to Minnesotans in general. What’s up with that? Anyway, I’m sure David Housewright doesn’t want my bigoted, conservative business, so I don’t plan to buy any more of his books. How about a roundup piece, Lars? You’ve read a ton of mysteries and thrillers. What stands out as personal favorites? Klavan’s books, I take it, and also many of Harlan Coben’s — ? Are there any of these that you would be interested in rereading? It would be interesting to know. Thanks. It’s not as easy as it sounds; it would take some research in the archives. Maybe when I can find time. Oh, nothing definitive — more along the lines of: These are ones that I think I particularly liked — ?